Until the recent introduction of Toric IOLs, people who are considered candidates for intraocular lenses could only have their nearsightedness and farsightedness corrected during cataract surgery. Patients with astigmatism would either require corneal refractive surgery (LASIK, PRK, or Limbal Relaxation Incisions) after lens implant surgery or they would remain dependent of glasses or contacts due to uncorrected astigmatism. While the AcrySof Toric IOL is considered a Premium IOL, it’s not a multifocal IOL like the ReSTOR or ReZoom. The AcrySof Toric IOL is ideal for those patients who have visually significant corneal astigmatism. Corneal astigmatism occurs when the cornea is not perfectly spherical (basketball shaped) and is instead slightly oval in shape (football shaped). The AcrySof Toric IOL has built in astigmatic correction which is used to counterbalance and correct the corneal astigmatism. This provides the patient with excellent single focus vision making it an excellent choice for the patient who wants the best distance vision they can achieve after cataract surgery without the need for glasses in most cases. Reading glasses, however, will most likely still be required in order to see up close. However, these reading glasses can usually be non-prescription “over-the counter” readers if toric lenses are used and the astigmatism in the eyes is neutralized. The AcrySof Toric IOL also provides an excellent choice for patients who enjoy monovision as a way of freeing themselves from having to need glasses. 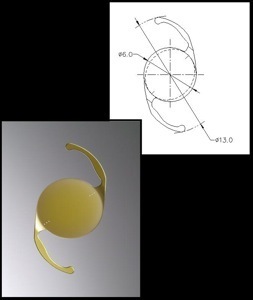 The single focus vision provided by these IOL’s is superior to that from the traditional monofocal IOL’s. To learn more click here.